Sheena & Ken Sambrook of the Crewe and South Cheshire Voluntary Group of Diabetes UK - http://crewe-and-south-cheshire.diabetesukgroup.org - are once again opening up their garden for a fund-raising Garden Party. The event will take place on Wednesday 8th July 2015, from 7pm, at their house at 6 Westfield Drive, Wistaston. Entrance is 50p and includes tea and biscuits. Strawberries & cream, cakes and jam will be available for sale. There will also be a prize draw. Please contact Ken for further information: Tel. 01270 662455. The ‘36th World Worm Charming Championship’ - http://www.wormcharming.com/ - took place on the afternoon of Saturday 27th June 2015 within the grounds of Willaston Primary School http://www.willastonprimary.co.uk/ , Willaston, near Nantwich, Cheshire. The Championship started shortly after 2pm and participants in each of the 144 plots had 30 minutes to collect as many worms as possible from their 3x3 metre plot. There were 'traditional' plots for teams of two and 'tag-team' plots for teams who wished to change their pairings throughout the charming period. Techniques included vibrating a garden fork, whacking a tennis racquet and jumping up and down. The Chief Wormer's trophy is usually given to the youngest wormer. However, this year it was given to Pam, Pat and Anne-Marie – who have a combined age of 216 - for the great effort they put into their charming in collecting 11 worms from plot 7. Most Promising Newcomer Award with 137 worms in plot 108 was won by the Smith and Williams families. The Heaviest Worm trophy was won by Alana Healy in plot 42 with 4.23g. The Championship trophy for Most Worms was won by The Caravan Club tag-team containing the Low, Tricketts, Bell and Shaw families in plot 14 with 227 worms. A tag-team from The Caravan Club also won in 2012. The championships also included representatives from Holland, Switzerland, Hong Kong and India. Event organiser Mike Forster gave his sincere thanks to all the volunteers and visitors for their continued support of the event. Events in the playground and arena included a performance by the Willaston School Percussion band, dancing by the X Academy of Performing Arts, the Willaston Scouts Ninja Poi Display Team, and singing by the Willaston Primary School Junior Choir. The arena and adjacent areas were surrounded by charity stalls, an inflatable slide and food and drink outlets. The event took place in hot and dry weather and was enjoyed by several hundred people. Cheshire East Council is set to appoint Kath O’Dwyer as its new Director of Children’s Services and Deputy Chief Executive. Kath is currently National Director, Social Care at Ofsted and previously headed up children’s services at Warrington Borough Council. The Council’s staffing committee has unanimously recommended the appointment and it has the support of political group leaders, who have already consulted their members about it. Full council will be asked for its formal endorsement in a vote on July 23. Councillor Rachel Bailey, Cabinet member for children’s services, said: “Kath has an exceptional track record both at Ofsted and in local authorities. “She improves performance while giving her colleagues real confidence in the quality of the services they provide. “Kath believes in putting the child at the centre of everything the service does and her appointment is a testament to our determination to make Cheshire East the very best place to grow up. Mike Suarez, Chief Executive, said: “The Director of Children’s Services is a critical role within the Council. “I am looking forward to working with Kath to transform our children’s services in line with the ambitious, innovation-led programme that the Council has set out. Kath, who has 32 years’ experience in the strategic leadership, operational management and delivery of services to vulnerable residents, said: “I am passionate about ensuring the best possible outcomes for children. Free wifi and charging sockets are turning Cheshire East’s mobile and tablet generation into bus travellers. That’s the claim from Transport Service Solutions, Cheshire East Council’s wholly-owned company that manages public transport. TSS is working with bus companies, schools and local organisations to provide more opportunities for bus travel. It is also backing Catch the Bus Week 2015 – which starts on Monday (June 29) – a nationwide campaign aimed at increasing awareness of the benefits of taking the bus. TSS recently helped launch bus company GHA’s upgraded Gold 88 and 42 services and their new Congleton ‘Beartown’ buses which serve the 90, 91 and 92 circular routes. Arriva has also introduced its new ‘Sapphire’ service on the 38 route between Crewe and Macclesfield. Councillor Gail Wait, chair of TSS, said: “It is great to see standards improving to help more people feel comfortable using buses as a greener alternative to cars. TSS manages the provision of home-to-school transport for more than 4,500 children, supports 20 school crossing patrols, issues more than 64,000 concessionary passes per year, maintains 1,483 bus stops and shelters across Cheshire East, updates 1,170 bus timetable displays and manages 602 transport contracts yearly to help people get to work and education. In the UK, more people travel to work by bus than all other forms of public transport combined. There are 2.5 million bus commuters, and another one million people use buses as a back up. Work is to begin on a major revamp of Crewe Crematorium to improve facilities for the bereaved. The £1.3m scheme, which starts on Monday July 6, includes extending the building, boosting seating capacity, improving toilet facilities and increasing parking for people with disabilities. Councillor Michael Jones, Leader of Cheshire East Council, said: “This is a major investment by the Council to greatly enhance and expand facilities for bereaved families and shows our commitment to deliver improved, quality services for our residents. Councillor David Marren, chairman of Orbitas – Cheshire East Council’s arms-length company which runs Cheshire East’s cemeteries and bereavement services, said: “This much-needed improvements investment will enable us to provide an even better quality of service for people at what is an emotional and difficult time for them. “The extension of the crematorium will allow family members and friends to more comfortably attend services for loved ones. Moreover, a cover will be included to shelter mourners before a service, where at present they have to stand exposed to the elements. “A new corridor system will also prevent the bereaved from a previous service from walking directly past mourners attending the next service – reducing potential further distress by giving mourning friends and family a greater sense of privacy and dignity. To facilitate the works, the Crematorium will close at 1pm on Fridays and reopen for services at 11am on Mondays. The work is due to be completed by late autumn. Alternatively, ring the cemetery office on 01270 685545. Welcome to this, MP’s 163rd news bulletin. You may have read the exciting news recently that Cheshire East Council has bought part of Crewe Town Centre for redevelopment, including the bus station, at a price that represents fantastic value to the council tax payers of Crewe and Nantwich. But it’s important that the Council looks after the existing tenants, and last week the Council Leader held a meeting to provide those all-important assurances. Those shops now have the security of knowing that they are not going to have to move on soon, and that their rents won’t increase, so they will still be able to provide their valued services to local people up until the point of development. Creative plans are being looked at for the bus station, which may be sited elsewhere in the town centre, and I for one am delighted that the Council - now that they own the bus station - are finally in a position to provide the public with the quality transport hub that they have been waiting for. As the tenant of 30 Victoria Street - one of the affected properties - I'm very much looking forward to hearing more about the developers’ plans this autumn, and am pleased that the Council have committed to proper consultation with Crewe’s retailers before coming to final decisions. All the evidence so far points to the Council thinking ‘outside the box’ for this exercise and that is definitely what is required. We have a once in a lifetime opportunity to address the way Crewe town centre works, and nothing should be off the table - including how traffic flows through the area. If you have any thoughts about Crewe town centre, please let me know and I will ensure they are passed on! Met with the new Leader of Crewe Town Council, Cllr Simon Yates, to talk about the Council's plans for the new municipal year and to resolve the ongoing issue between the Town Council and some of our town's allotment holders. You can read more about it here. Held my regular constituency advice surgeries in Crewe and in Shavington. Rolled the opening pie at the annual Wybunbury Pie Wakes. Welcomed a report from British Gas that 3,438 homes in Crewe & Nantwich are now benefiting from smart meters, helping residents to monitor and better control their energy bills. Met with Paul Coleman at South Cheshire Chamber of Commerce to talk about progress on the Crewe Pledge. 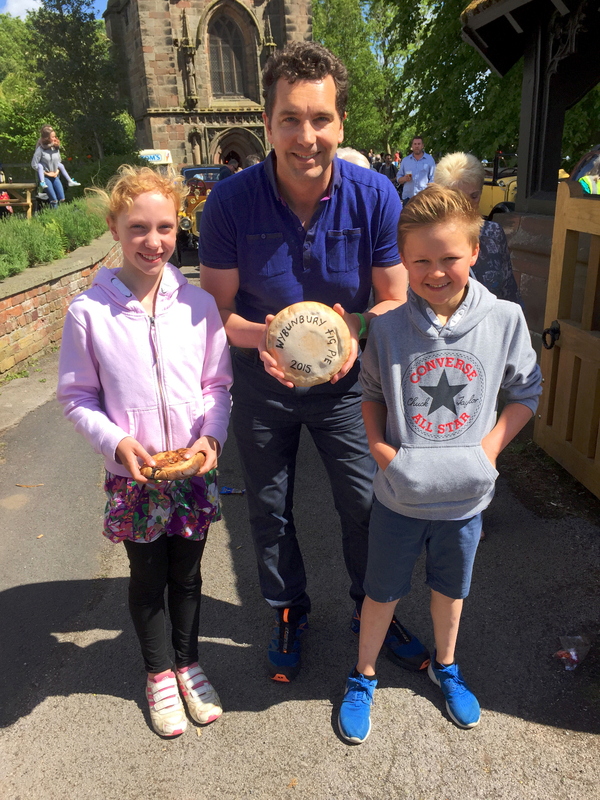 I was delighted to attend the annual Fig Pie Wake organised by the Wybunbury Tower Preservation Trust. Congratulations to Mark, John and all those who helped organise another hugely successful event, but most of all thank you to Melanie Booth at The Swan for baking my pie. I am pictured with Jo and Lucas, the Head Girl and Head Boy at Wybunbury Delves Primary School. Export giants Bentley Motors and Mornflake lead the way in what has been referred to as Crewe’s ‘second industrial revolution’ they are joined by 17,000 businesses in Cheshire East – more than Manchester. 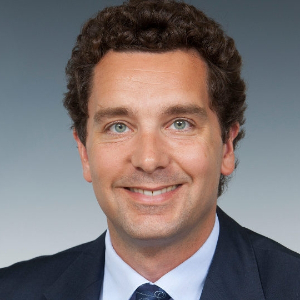 The Chronicle interviewed Edward Timpson MP about his new promotion to Minister of State for Children and Families. 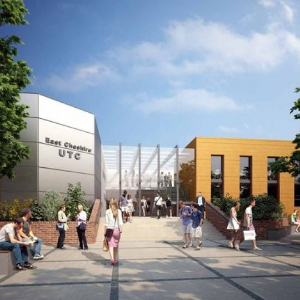 The new Crewe Engineering and Design University Technical College (UTC) will provide training for up to 800 students, aged 14 and 19, who want to pursue careers in automotive, rail and manufacturing industries. Two Cheshire East organisations have won the Queen’s Award for Voluntary Service – the MBE for local groups. Cre8, which provides services for young people in Macclesfield, and Chelford Tenants and Residents Association each received the award to recognise the work done by their dedicated volunteers. Rob Wardle, Cre8’s director, said: “It is just hugely encouraging for all of us involved with Cre8 to receive this award. “A lot of our work is with young people which can be exciting and fun, as well as disappointing and very draining at times. Chelford Tenants and Residents Association has also been honoured with the Queen’s Award for its work to combat social isolation among older people. Michael Jehan, who chairs the association, said the award made him feel ‘very proud and privileged’. He added: “It is a testament to the hard working volunteers who have made such a difference to our local people, and to our supporters without whom we would not exist. “As well as providing a wide range of activities including a community garden project, social events, coach trips and computer classes we also support our mainly older tenants to improve their housing, local communities and lives generally. The two organisations will receive their awards later this summer from the Lord Lieutenant of Cheshire, David Briggs MBE, KStJ. Councillor Les Gilbert, Cheshire East Council’s Cabinet member for communities, said: “We fund both of these organisations because their volunteers do a lot to improve people’s lives and their work is of immense benefit to communities in Cheshire East. “Cheshire East Council is pioneering new ways to tackle the root causes of problems in society and we regard active and dedicated voluntary groups as important allies. “By helping young people to play an active role in their neighbourhoods, or helping older people to live independently and get the most out of life, they are doing a vital job. A woman faces a bill for £9,500 after she claimed benefits while keeping it secret that her live-in partner was supporting the family financially. Ruth Evans, 37, claimed housing benefit and income support but failed to disclose that her partner had joined the household. By falsely claiming that she was a lone parent on a low income, she received £8,932 before her lies were discovered by Cheshire East Council’s benefit investigations team. Evans, of Platt Avenue, Sandbach, admitted one charge of failing to advise Cheshire East Council and the Department for Work and Pensions that she had a resident partner when she appeared at South and East Cheshire Magistrates Court (on June 15, 2015). Magistrates sentenced Evans to a 12-month community penalty with 80 hours’ unpaid work. She was also ordered to pay £520 costs and a £60 victim surcharge. Cheshire East Council today held a ceremony to mark Armed Forces Week. The Armed Forces Day flag was raised outside the authority’s Westfields HQ in Sandbach at 10am today (June 22), by Council Leader Michael Jones and the authority’s armed forces champion and former mayor Councillor Gordon Baxendale. The occasion was in support of efforts to get hundreds of armed forces flags flown at significant, strategic and eye-catching sites across the UK. Armed Forces Week provides an opportunity for communities to show their support for the men and women who make up the forces community, from serving members of the Army, Royal Navy and Royal Air Force to service families, veterans and cadets. Events are being held across the nation in coming days to mark Armed Forces Week. These range from major set-piece events including military personnel to smaller scale, community-based events. Among the events planned locally is a ‘picnic in the park’ being held on Sunday (June 28) at Queens Park, in Victoria Avenue Crewe. Cllr Jones said: “Cheshire has a long and distinguished history of military forces being based within the county and Cheshire East Council is proud to be a signatory to the Armed Forces Community Covenant. The Government has published a national Armed Forces Covenant which sets the tone for Government policy aimed at improving the support available for the armed forces community. The core principles are that members of the armed forces community do not suffer disadvantage as a result of their service and that they receive special treatment where appropriate. For further information visit the Armed Forces Covenant pages on the GOV.UK website. The Wistaston Village Fete took place on the afternoon of Saturday 20th June 2015. This annual event is organised by the Wistaston Community Council and took place at Wistaston Church Lane Academy, Church Lane, Wistaston for the first time, by the kind permission of the Head and the governors. The event began with a procession from Wistaston Memorial Hall led by a Scottish Piper Reg Flower, followed by the 35th South West Cheshire Scout group with Union Jack flag, St Mary’s Guides, Brownies & Rainbows, and a dance troupe. The procession also included the retiring Wistaston Rose Queen (Lucy Rowland) and her Attendant (Charlotte Shaw) in an open-top sports car and this year’s Wistaston Rose Queen (Rachel Astbury) and her Attendant (Chelsea Horne) in an open-top vintage car. Once the procession had arrived within the Arena at the Academy the retiring Rose Queen (Lucy Rowland) thanked Wistonian's for their support and stated that over £5,000 had been raised to be shared between two organisations - 35th South West Cheshire Scout group and Cancer Research UK - during her year of office. St. Mary's Wistaston Rector Mike Turnbull then passed the crown from Lucy to this year's Rose Queen (Rachel). Rachel stated that her chosen charity this year is Macmillan Cancer Support. This year’s Wistonian of the year, Gwyneth Brown, then officially opened the Fete. Ken Sambrook and John White were the Master of Ceremonies and introduced each event in the Arena and school hall respectively. Gwyneth Brown, presented prizes to the winners in the Laurie Twiss Award for Journalism. The winner was Emilymay Stockton, with second prize awarded to Daisy Williams and third prize awarded to Antonia Monks. They are all pupils of Wistaston Church Lane Academy. Several children took part in the fancy dress competition and entries included a policeman, a burglar, a bear, a pirate and several princesses. The winner was 5 year old Poppy with her Hawaiian girl costume, with 3 year old Samuel getting second prize for his Robot costume. They collected their prizes from judges Gwyneth Brown and Eileen Bamber. All of the children who entered received a bag of sweets. The Arena also had displays by the 35th South West Cheshire Scout group, Hartford Gymnastics Display Team, The Alison Gallagher School of Dance, and Liberty Morris Dance Group. In the school hall there was entertainment from Wistaston Church Lane Academy Choir, Scottish Dancers, Irish Dancers and TheFunkyChoir.com. There were over 30 stalls representing local organisations and charities, plus refreshments stands. Refreshments were also available in the school hall. After early showers, the event took place in mainly sunny weather and was enjoyed by several hundred people. A fund-raising music night takes place on Saturday 4th July 2015 (8-10pm) at St Mary’s Church Hall, Church Lane, Wistaston CW2 8ER. Doors open 7.30pm. Tickets = £5 and are available from St Mary’s Church Office, Malbank School office & Brine Leas School office. Music will include the ‘Muckers’ ukulele band and an acoustic set by ‘Lost in Space’. Soft drinks and hot dogs will be available for purchase. The event is to raise money for Camps International in Cambodia. Cheshire Police are issuing a warning to users of Facebook across the county regarding a blackmail scam. A Facebook user was befriended by a girl. A short time later, a doctored image of the victim was sent to their employer’s Facebook page. This image showed the victim engaging in a sexual act in the presence of a child. The victim then received a message stating that unless £7,500 was paid the photograph and images like it would go viral and the victim’s life would be ruined. Cheshire Police are advising people not to befriend people they don’t know on Facebook. If you are subject to any criminal activity contact the police on 101. Cheshire Police has now released an efit of a woman they would like to speak to in relation to three burglaries in Crewe. In all of the incidents, which occurred in the Crewe area, a woman has attended the homes of elderly residents claiming that she is there to repair LifeLine equipment. Cheshire East helped launch a special event to commemorate the bicentenary of the Battle of Waterloo. The landmark battle took place outside Brussels on June 18, 1815. The decisive defeat of the forces of France’s Emperor Napoleon established a new balance of power for generations. The Duke of Wellington’s victory at Waterloo is seen by many as one of the most significant in British history – and British troops did not fight and die on western European soil again for another 99 years. As a Borough, Cheshire East has few direct links to the Battle of Waterloo. However, the iconic White Nancy landmark, built on the edge of the Saddle of Kerridge, overlooking the village of Kerridge and Bollington town, was built in 1817 to commemorate the victory. Yesterday evening saw a commemorative run/walk to the landmark, to celebrate the bicentenary of the historic battle. The White Nancy has even been given a smart Napoleonic makeover to mark the occasion – complete with silhouettes of figures in period costume – and will provide the focus of a community led festival running from 19-21 June. Councillor Gordon Baxendale, Cheshire East Council’s armed forces champion, who officially started the commemorative 2km run/walk from Bollington Recreation Ground to White Nancy yesterday, said: “The Battle of Waterloo was a landmark victory for Britain and her allies – in which Napoleon was finally defeated once and for all – and a real turning point in European history. “It was fitting to commemorate those events, and those who fought and died at Waterloo, exactly 200 years later at a landmark created here to honour that famous victory. As well as commemorating the victory and promoting the White Nancy Waterloo 200 Festival, the run/walk event also highlighted the beautiful countryside of Cheshire East and the work of Cheshire East Council’s public rights of way and ranger services. Communities and businesses throughout Cheshire East are setting out to prove that the Borough is the best in the North West in yet another field of endeavour – making scarecrows. The Council is running a competition for sponsors and trade stands at the Cheshire County Show, who are being asked to feature a scarecrow on their plot. Show-goers will be encouraged to follow the scarecrow trail, visiting each trade stand with the chance to win a prize. The Council will also be featuring a ‘scarecrows’ committee’ on its own stand, showcasing the work of eight community groups. The best scarecrow will be rewarded with a £100 donation to the community group that made it. One of the entries is from Poynton Pandas, a drop-in support group for parents with pre and postnatal mental illness which is run by a constituted, voluntary group of six mothers. Mrs Scarecrow, whose baby Annabelle arrived by emergency cesarean two weeks ago, was referred to Poynton Pandas by her midwife, so that she can talk about her feelings with others who have been through similar situations. Mr Scarecrow is pleased that she is getting support. Councillor Les Gilbert, Cheshire East Council’s Cabinet member for communities, said: “Cheshire East has consistently been named by the Halifax Quality of Life Survey as the best place to live in the North West. “We know that one of our biggest strengths is our community spirit. We have vibrant and strong local communities, which bring local people together to improve their area and gets things done. Cheshire East Council is again one of the principal partners of the Cheshire Show on June 23 and 24. The sponsorship underlines the authority’s love of farming and the countryside, as well as its determination to support the rural economy. The Cheshire East stand will be easy to spot on the Cheshire County Showground at Tabley, near Knutsford. It will be dominated by a 46 sq m outdoor television screen that will show live footage from events around the showground as well as videos showcasing the best of Cheshire East. · Catch up with Cheshire East Highways officers about the latest plans to improve our road network. Cheshire East Council’s trading standards officers and Cheshire Constabulary are warning residents to beware of scams after a series of incidents in the Crewe area. A woman has called on elderly residents claiming to be a LifeLine alarms repairer. But once inside their homes she stole personal items. The offender is white, aged mid-30s to early 40s, with slim to proportionate build and dark shoulder-length hair. She was smartly dressed and wore a lanyard with a fake identification badge. In an unrelated incident, two men in a white van charged an 86-year-old householder £440 for lopping some branches off a tree. Trading standards officers are advising residents not to purchase goods or services from cold callers either knocking at the door or via an unsolicited phone call. Councillor Les Gilbert, Cheshire East’s Cabinet member for communities, said: “Our trading standards officers keep track of scams and we are working with Cheshire police to protect the public. ■Sell a ‘sob story’ or say that their livelihood is in danger. ■‘If you don't have work done it could cause further damage’. ■Cheshire East Council’s Trading Standards can provide a ‘super sign’ that tells cold callers to leave. Ring the Citizens Advice Consumer Service on 03454 04 05 06 to obtain yours. Cheshire East Council is backing the Middlewich Folk and Boat Festival on its 25th anniversary – with thousands of visitors expected in town for the annual event. Up to 15 venues will host music and dance from Friday, June 19, through to Sunday, June 21, with the likes of Newcastle legends Lindisfarne and the Neville Staple Band headlining. Artists from around the world will perform on the canalside and in the town centre and there will be a brilliant floating market and hundreds of beautiful canal boats. The Council has committed to pushing through a number of new projects in the town such as the eastern bypass and the reopening of the railway station and is one of the Folk and Boat Festival’s key sponsors. Councillor Michael Jones, Leader of Cheshire East Council, said: “Middlewich is the centre of boating in Cheshire and the Folk and Boat Festival, now in its 25th year, is one of the county’s great events. “It’s a great, fun day and I encourage as many people as possible to go along. In the long run we want to improve parking in the town so that the festival can get even better. “It is great for the Middlewich economy but we want people to visit the town more often and make it a destination point for many things. Cheshire East Council has pledged a strong commitment to creating a bright future for Middlewich. Working closely with Middlewich Town Council and Congleton MP Fiona Bruce, Cheshire East is lobbying for new roads to improve connectivity in mid-Cheshire, create a vibrant town centre and high street, infrastructure to support a marina, new leisure facilities, housing, schools, bus routes and cycle links and a revamped railway station. And the Council estimates that up to 3,000 jobs could be created over the next five years as a result of increased investment in Middlewich. Cheshire East Council is about to launch a major initiative to involve residents and businesses in plans to improve Crewe town centre. During July, the Council will seek the views of residents and businesses through the media, social media channels, face-to-face meetings and an in-depth survey. The move comes at an exciting time for Crewe, which could be set for its most significant town centre development scheme in decades. In April, the Council acquired the Royal Arcade site for £6m, which includes the bus station and 26 retail units along Queensway and Victoria Street. The bold move followed years of speculation since the Delamere Place retail and office scheme stalled in 2009. Councillor Michael Jones, Leader of Cheshire East Council, said: “We believe in putting our residents and businesses first, so we are not going to make any decisions until we have heard what people have to say. “We need them to tell us what they want, so that we understand better the role that the Council can play in giving our residents the town centre they deserve. “We’ve already secured millions of pounds of investment for the town centre through the new Lifestyle Centre and the University Technical College, which will both open in 2016. “We believe there is an opportunity to forge a role for the town centre as a destination for families to spend quality leisure time – but we need to know whether people support this idea. Events to discuss ideas and opportunities, where council officers will be available to answer questions. More information will soon be available in the local media and on the internet. People looking for cheap flight tickets are being targeted by fraudsters. New websites are continuously being created with slight changes to the company names with the intention to deceive the public. They offer tickets at bargain prices and usually request for payment via bank transfer. These tickets do not materialize and the funds are retained by the fraudsters. Social housing tenants will be offered cheaper energy thanks to a deal between a leading housing association and Cheshire East Council. Peaks and Plains Housing Trust has signed up to support Fairerpower, the gas and electricity supplier launched by the Council in conjunction with OVO Energy in March. Along with the pay-monthly options, Peaks and Plains’ 5,000-plus householders could benefit from Fairerpower's pay as you go tariff, which is currently the cheapest prepayment tariff in the UK (see notes 1a/1b). Fairerpower, a partnership between the Council and OVO Energy, has currently saved pay as you go customers £108 annually (see note 2). So far, more than 1,800 people have switched to Fairerpower, potentially saving a combined total of £414,000 per annum (see note 3). Councillor Michael Jones, Leader of Cheshire East Council, said: “I am delighted that Peaks and Plains Housing Trust has joined our battle against fuel poverty. “Our pay as you go tariff is good for their customers, who are also our residents. We believe in putting our residents first and we look forward to more and more housing association tenants switching their energy supply to us. Fairerpower will also supply Peaks and Plains with gas and electricity for their empty properties and the commercial properties that it occupies or rents out. · A refer-a-friend scheme which offers a £20 Amazon gift certificate for referrer and referee (See note 5). To find out more about Fairerpower or to switch, please go to www.fairerpower.co.uk or call 0800 408 6701 (pay monthly) or 0800 408 6705 (PAYG). Cheshire East Council has secured government grant funding to provide electric vehicle recharging points for local road users – and potentially the Council's own fleet. Electric vehicle (EV) technology is relatively new but the number of electric vehicles in the UK has risen in the last two years from 3,500 in 2013 to 15,500 in 2014 - and the expectation is for that figure to keep on growing and growing. The grant funding from the Office for Low Emission Vehicles (Olev) will enable the Council to provide six 50kV rapid charging units – two each in car parks in Congleton (Princess Street), Wilmslow (South Drive) and Nantwich (Love Lane). The units will be operated by a third party. These units can recharge a vehicle from ‘empty’ up to 80 per cent charge in as little as 20 minutes. The sites have been chosen as they are close to destination points such as supermarkets and coffee shops, where drivers can pass 20 minutes or so while waiting for their vehicle to charge. Council Leader Michael Jones said: “This is good news for the environment and for encouraging modern, greener transport to flourish. It is also about thinking and acting innovatively – and about putting our local residents first and tackling issues at their root. EV users will be able to check the status of the chargers using mobile phone apps or web links. There are already 563 publicly-funded rapid charge points in the UK – and these are the first in Cheshire East. The Council also secured funding for five 7kV ‘fast charging’ units. These will primarily be installed on Council-owned sites to enable the authority to begin using EVs in its own fleet. They have been installed at Macclesfield Town Hall, the Council’s HQ at Westfields, Sandbach and Delamere House, Crewe. There are also two fast chargers in the Library car park, in Crewe near the flagship Lifestyle Centre, and these will be made available to the public in due course. After a review of the senior management structure at Cheshire East Council, it has been agreed that the role of executive director for strategic commissioning will become redundant. As a result, Lorraine Butcher will be leaving the Council to seek new challenges. Mike Suarez, Chief Executive of Cheshire East Council, said: “I would like to thank Lorraine for her significant contribution and wish her all the best in her future endeavours. Mrs Butcher added: “Having been part of the leadership team that established the Council when it was formed in 2009, I have been pleased to have played a strong role in my respective roles of head of children and families, director of children’s services, strategic director of people and, latterly, executive director for strategic commissioning. “The challenges faced by councils, and the public sector in general, are significant. I am keen to make a wider contribution to these in ways that give me more flexibility about how I deploy my skills and experience. “I would like to thank all those colleagues that I have worked with, and who have supported me, along with those from partner agencies across the sub-region who share my commitment to do the very best for residents, through finding new and frequently better solutions to our shared challenges”. The annual Wistaston Village Fete takes place this Saturday 20th June at a new venue: Wistaston Church Lane Primary School, CW2 8EZ. The event will start with the Rose Queen procession from the Wistaston Memorial Hall at 1:30pm with a tour including Westfield Drive, White Hart Lane, Kings Drive, Princess Drive, Holyrood Drive, and Sandringham Drive, arriving at the school field for the official opening of the fete. This year's fete will be bigger than ever with over thirty stalls as well as events in the arena. The theme this year is ‘Colours of the Rainbow’. Admission to the fete is by donation and proceeds go towards other Wistaston village events. 1:30pm – The Piper leads the Rose Queen’s procession from Wistaston Memorial Hall to the School. 1:45-1:50pm – The Piper leads the Rose Queen into the Arena at the School. 1:50-2pm – Rose Queen, Rachel Astbury, is crowned by the Rector, Mike Turnbull. Wistonian of the Year, Gwyneth Brown, opens the fete. Judging of Fancy Dress by Gwyneth Brown and Eileen Bamber. Come and enjoy the fun of the fete – don’t forget the Children’s Fancy Dress competition. There will be a Tombola, many other stalls to tempt you, many games to play and there will be a Thomas the Tank Engine to take you on a little journey around the field. Two fraudsters will each have to pay back about £10,000 after they were caught claiming benefits they were not entitled to. Sylvanie Samba, 30, admitted failing to report a significant increase in her earnings between April 2010 and January 2015, which led to her wrongly receiving £9,070 from Cheshire East Council. At South and East Cheshire Magistrates’ Court (on June 5), Samba, of Hammond Street, Crewe, received a 12-month community order with 120 hours of unpaid work and was ordered to pay £600 costs and a £60 victim surcharge. In an unrelated case at the same court (on the same day), Hayley Potts, 36, admitted fraudulently obtaining £10,527 in housing benefit and Council Tax support by failing to declare that her partner was living with her and supporting her financially. Potts, of Stone Chair Lane, Scholar Green, near Alsager, was fined £460 with £600 costs and a £46 victim surcharge. Both women will have to repay in full all the benefits that they fraudulently received. The prosecutions were brought by Cheshire East Council’s legal team. “The defendants in these cases thought they could get away with claiming benefits they were not entitled to, but they were making a big mistake. “They have ended up with criminal convictions for a serious offence of dishonesty and now face a big bill to repay the money they have falsely claimed. Council leader Michael Jones has a message for dealers selling a new type of legal high that is known to prove fatal – ‘stay out of Cheshire East’. It follows an alert from Cheshire Police after several incidents elsewhere in Cheshire. Cllr Jones is also appealing to parents and schools to be extra vigilant and to watch out for tell-tale signs among young people who may be tempted to try Vertex (also known as space cadet), a new legal high known to have caused deaths. Councillor Jones, who recently announced a major new policy around intervention and support for young people with troubled lives, said: “People who peddle these legal highs are despicable and are preying on the vulnerable and the young. Cheshire police Assistant Chief Constable Mark Roberts has appealed to anyone supplying Vertex to stop and for anyone who has purchased it, has used it or is considering using it, to stop. Councillor Jones said: “This is extremely worrying and I appeal to Cheshire East residents to report any suspicions to the police. Steph Cordon, Cheshire East Council’s head of communities, said: “Young people think so-called legal highs are a safe option but there have been nearly 200 deaths in England associated with these substances. Vertex or ‘space cadet’ is known to contain a highly dangerous chemical linked to a number of deaths on the continent and it is now being sold on the streets and in schools with several incidents reported in Cheshire. The project which created Crewe’s new railway station entrance has scooped a top award. It has now won the prestigious ‘sub-regional project of the year award’ at the North West Regional Construction Awards 2015. The project, which is part of the ‘All Change for Crewe’ regeneration initiative, also scooped a ‘highly commended’ in the ‘integration and collaborative working’ category. The scheme is also in the running for national awards at the Chartered Institution of Highways and Transportation (CIHT) this week. Councillor Don Stockton, Cheshire East Council Cabinet member in charge of regeneration and assets, said: “I am thoroughly delighted that the Crewe Rail Exchange project has won recognition both regionally and nationally. “The new entrance is really good news for Crewe, looks fantastic and has helped to improve access into and around the railway station. ‘Thank you’ to all carers in Cheshire East! Cheshire East Council and its partners are saying a huge ‘thank you’ to the Borough’s carers this week with a series of events. Carers’ Week runs until Sunday, June 14 and the Council is showing its support for their invaluable work by offering them chances to have a break, enjoy complementary therapies and take part in afternoon tea sessions. Carers’ Week celebrates and recognises the contribution made by the UK’s 6.5 million carers who look after an ill, frail or disabled family member or friend. Together with NHS Eastern Cheshire and NHS South Cheshire Clinical Commissioning Groups (CCGs), Cheshire East is committed to supporting unpaid carers of all ages and is working towards building ‘carer-friendly communities’. As a partnership, it has also made a pledge towards achieving this on the ‘pledge wall’ at www.carersweek.org and is encouraging residents and businesses in Cheshire East to do the same. Councillor Janet Clowes, Cabinet member in charge of adults, health and leisure, said: “We would like to encourage as many carers as possible to attend the Carers’ Week events in Cheshire East. · Carers’ Afternoon Tea, Crewe Citizens Advice Bureau (CAB) – 1.30-3.30pm. · Carers’ information and relaxation therapies, Knutsford Methodist Church Hall – 12-3pm. · Crewe carers’ careers event, Brierley Street – 10am-2pm. · Carers’ Afternoon Tea, Congleton Disability Information Bureau – 1.30-3pm. · Complementary therapies, Neuromuscular Centre, Winsford – 10am-4pm. · Parent carer celebration event, Ruby’s Fund Congleton – 10.30am-1.30pm. · Drop in, Macclesfield Office Ropewalks – 10am-1pm. · Day trip to carers’ caravan in North Wales (transport from Crewe) – 10am-4.30pm. · Crewe Support Group, Unit 1 Crewe office, relaxation techniques – 12-2pm. · Garden party, East Cheshire Hospice, Macclesfield – 4-7pm. · Caring with confidence, Handforth Health Centre – 10am-1pm. · Carers’ Afternoon Tea, Shopmobility Macclesfield – 12-2pm. · Visit to Ness Gardens, Neuromuscular Centre, Winsford – 11am. · Information Stall, Leighton Hospital Outpatients, Crewe – 10.30am-2pm. · Carers’ careers event, Macclesfield Library – 10am-2pm. · Family fun event, Congleton Leisure Centre – 1.30-3.30pm. Some of these events require pre-booking, call Carers’ Trust Cheshire and Warrington on 01270 257331 for details. For more information on events at the Neuromuscular Centre in Winsford, call 01606 860911. Most of the events above are organised by Carers’ Trust Cheshire and Warrington and Advice Cheshire East, and are sponsored and backed by Cheshire East Council. The regulations make it compulsory for all landlords to fit smoke alarms in rented homes and are expected to come into effect from October 2015. Cheshire firefighters will be promoting targeted safety messages throughout the Chief Fire Officers Association's Road Safety Week. Two members of the public who saved the life of a 94-year woman in Ellesmere Port after rescuing her from a house fire have been given an award from Cheshire Fire and Rescue Service. Chief Fire Officer Paul Hancock awarded the men a Community Award at Ellesmere Port Fire Station on 2 June for their brave actions that ultimately saved the woman’s life. Cheshire Fire and Rescue Service will once again be at Cheshire Show, engaging with members of the public delivering vital road and fire safety information, along with the famous children's yellow helmets. Cheshire Fire and Rescue Service fire stations will be holding a number of free fire station open days over the next couple of months. At 1.23am on Wednesday, June 3 Cheshire police received a call of concerns for the welfare of four people outside James Lee House in Brick Street, Warrington. Three men and a woman were taken to hospital. The three men have since been discharged but the woman remains in a serious condition. Evidence suggests they may have consumed the legal high, Vertex. Information suggests there have been other recent cases linked to the consumption of Vertex. Police and Warrington Borough Council now have serious concerns over this particular substance and are investigating it. More than 70,000 homes and businesses have now been given access to high-speed broadband – thanks to the Connecting Cheshire project. The partnership between four Cheshire councils including Cheshire East and BT will provide fibre broadband to residents and businesses with speeds of up to 300mbps*. When added to the commercial rollout by BT and other broadband providers, there will be 96 per cent coverage by the end of 2015. This month, the first cabinet from the Church Minshull exchange was completed and is now accepting orders, providing fibre broadband to around 200 premises in the village. Further coverage in this area is expected to be completed over the summer. Other recent areas now benefiting from superfast speeds include Malpas, Elton, Farndon, Lymm, Pickmere and Congleton. One year on from the launch of the ‘Fibre Guy’s’ marketing campaign, Connecting Cheshire has been recognised as one of the best projects in the country in regards to take-up and demand stimulation. Councillor Michael Jones, Leader of Cheshire East Council and Ward member for Bunbury, which includes Church Minshull, said: “This is more good news for residents and local businesses. “We are well on our way to connecting 80,000 premises across Cheshire. The roll-out of superfast broadband is going to benefit rural communities significantly. Terry Golding, an experienced professional voiceover for TV, radio and online, recently upgraded to superfast broadband in Malpas at his home studio thanks to Connecting Cheshire. He is delighted with the difference it has made to his business. A Cheshire school is set to build a new car park to tackle traffic chaos on the school run. Children going to Stapeley Broad Lane Primary School in Nantwich have to be dropped off on the A529. Cars are often parked on both sides of the road, creating a bottleneck. But now head teacher Ian Shackleton has written to parents telling them that work will start over the summer. Councillor Rachel Bailey, Cheshire East Council’s Cabinet member for children and families, has welcomed the news. She said: “I am pleased to hear that a solution is now within reach. “We are pleased to hear that the school is now in a position to go ahead with the work. Most sectors of Cheshire East’s property market are expanding thanks to a buoyant small business sector and significant investments by major employers. These are the findings of the Cheshire East Commercial Property Review 2015, which was launched in front of about 100 professional advisers and investors at Alderley Park Conference Centre. In the foreword to the report, Council Leader Councillor Michael Jones said: “This review shows that the property market has well and truly woken up to the strength of our economy. “More and more industrial, retail, office and leisure occupiers, on whom the market depends for its livelihood, are finding that Cheshire East is a great place to do business. “Cheshire East Council is setting out an ambitious plan to support the creation of more than 31,000 new, predominantly private sector jobs by 2030. This will mean greater skills, fewer people claiming benefits and less dependence on public sector employment. The review reveals that take-up of industrial floorspace rose by 70 per cent to 76,602 sq m in 2014, with transactions doubling compared with the prior year. The largest deal was the letting by warehousing property specialist Prologis to Optima Logistics of a 17,229 sq m building warehouse at Midpoint 18 in Middlewich. There were 45 office deals involving 22,300 sq m of space overall, with activity running 30 per cent above the five-year average for the Borough. All but two transactions involved less than 10,000 sq ft, reflecting the strength of the borough’s small and medium-sized enterprises. Housebuilding was slightly up on the prior year, with 663 new dwellings built, 3,943 under construction, and planning permission granted for 5,395 homes on 42 sites. Waters Corporation, a manufacturer of mass spectrometry instruments, opened its new headquarters outside Wilmslow and Bentley Motors announced its largest ever investment in Crewe, spending £40m on a new research and development centre that will create over 300 new jobs. Dr Chris Doherty, Alderley Park site director for Manchester Science Partnerships, said the former AstraZeneca research and development base expected to attract up to 100 companies, including start-ups, which would create ‘a new cohort’ of biotech companies for the region. Julian Cobley, Cheshire East Council’s head of investment, said the Borough’s appeal was based on quality, with the Cheshire Science Corridor linking together the Alderley park BioHub, AstraZeneca’s Hurdsfield site and Jodrell Bank in a cluster capable of generating significant economic benefits. The launch was attended by about 100 agents, developers, landowners, chartered surveyors and planning consultants active in the commercial property market, who were keen to hear about the development opportunities available in Cheshire East. They were also able to meet key Cheshire East officers and those providing complementary services to the property market in the Borough. Household waste recycling centres go from strength to strength in Cheshire East – and get the thumbs up from residents! The recycling of household waste is going from strength to strength in Cheshire East – and proving a hit with local residents. The Council’s nine household waste recycling centres (HWRCs) across the Borough are now reusing and recycling 79.7per cent of items and diverting them from becoming landfill. This is almost nine percentage points higher than the figure for 2008/9 (71 per cent) when the new unitary authority of Cheshire East was formed. Moreover, a recent survey of HWRC users gave the service an overall customer satisfaction rate of 96.6 per cent. Staff helpfulness was rated at 95.9 per cent while the availability of information scored 82.3 per cent. Since April 2008, the HWRCs have reduced the amount sent to landfill by 43 per cent or almost 6,500 tonnes a year – saving the Council nearly £400,000. Thanks to our residents, the Council is the eighth-best unitary authority for recycling in the UK and the second best in the North West. Councillor Don Stockton, Cheshire East Council Cabinet member in charge of regeneration and assets, said: “These figures are more excellent news and I would like to thank not only our excellent staff but also, most importantly, our residents for working with us to make Cheshire East a cleaner and greener place to live, work, visit and do business. “We will not be resting on our laurels and will continue our efforts to reduce the amount of waste we send to landfill and improve our recycling service further. “The feedback provided by residents was excellent, with some extremely positive comments relating to the levels of service and the helpfulness of staff. “We also gained insight into where improvements could be made, such as on-site staff wearing ID badges, and our contractor, HW Martin, is reviewing the results to see where more improvements could be made. In support of Adult Learners’ Week 13th – 19th June, the staff at Crewe & Nantwich Pitman Training Centre on Hospital Street in Nantwich are opening their doors to offer free advice and guidance to anyone interested in developing their skills, getting a promotion, planning the next steps in their career or looking for a new job this year, and join in with the celebration of lifelong learning. With free tasters of a range of Pitman Training courses, 1-2-1 advice consultations on career planning, creating 5 year tailored career plans, Career MOT testing, CV writing workshops and recruitment support and advice on offer throughout the week, Manager, Allan Virr, is looking forward to meeting local people who are keen to keep pushing their own boundaries. He said: “We pride ourselves on being advocates of lifelong learning, and genuinely believe in the opportunities it brings to change and transform lives. We ran our open week last year during Adult Learners Week and it was a huge success. We saw and inspired hundreds of people from all over the region, of all ages, in many different situations, and helped them discover how lifelong learning can help change lives. Feel free to drop in to the centre at any point through the week or alternatively, to find out more information on the career clinics available, you can call 01270 626 084 or find visit www.pitman-training.com/crewe-and-nantwich. Claire Lister, MD of Pitman Training Group is a huge advocate of lifelong learning, and having headed up Pitman for 17 years and now developing the International franchise expansion, she regularly undertakes CPD (Continuing Professional Development). Cheshire East Council has welcomed the announcement by Transport Secretary Patrick McLoughlin that the Government is aiming to bring forward the construction of high speed rail to Crewe sooner than planned. The final route has yet to be decided but the Council is delighted that the Secretary of State has called for HS2 to be ‘fast tracked’ and indicated again that Crewe could become the first northern hub for HS2 before the 250mph service continues to Manchester to form a new super-fast link across the Pennines. Mr McLoughlin said in a key speech in Leeds yesterday: “I want to see if we can bring HS2 to Crewe faster than planned, subject to further analysis and a decision on the preferred route. Commenting on the announcement, Cheshire East Council Leader Councillor Michael Jones said: “This is fantastic news and a real game changer – not just for Crewe and Cheshire East, but for Stoke, North Staffordshire and the whole region. 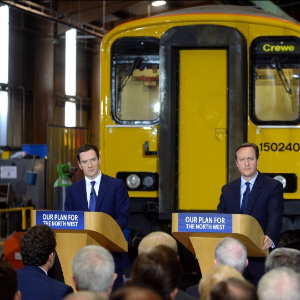 In October 2014, Sir David Higgins, Chairman of HS2 Ltd, announced Crewe as the preferred location for a Superhub north of Birmingham. He also indicated it was hoped to deliver the northern section of the project five to six years sooner than the expected date of 2032. Because of this, the Council is throwing its weight behind plans to boost education and training in the area to broaden and raise the academic and vocational skills and achievements of students.